Noting that “defence is the first duty of government”, a panel of parliamentarians tasked with reviewing Britain’s defence posture has called for a significant rise in national defence spending which if delivered would see the country catapulted into the top-three defence-spending nations worldwide. Released Monday morning, the House of Commons Defence Committee report entitled ‘Beyond 2 per cent’ called for the government to increase spending on defence from scraping the two percent NATO alliance minimum seen today to a first-rate world power three percent of GDP. If realised, the increase would see the United Kingdom able to face “the scale and range of intensifying threats” and would be the equivalent of a roughly £14 billion rise in defence spending, reports The Times. In absolute terms, that would put Britain ahead of Russia and France and just behind the United States and China as the third largest spending military nation in the world, according to figures released by IHS Jane’s. Noting that the United Kingdom had spent three percent of GDP on defence as recently as the mid-1990s, the report stated that without a firm and sustainable commitment from the treasury to defence, the latest defence spending review — known as the Modernising Defence Programme — would fail, as others before it in recent memory had. 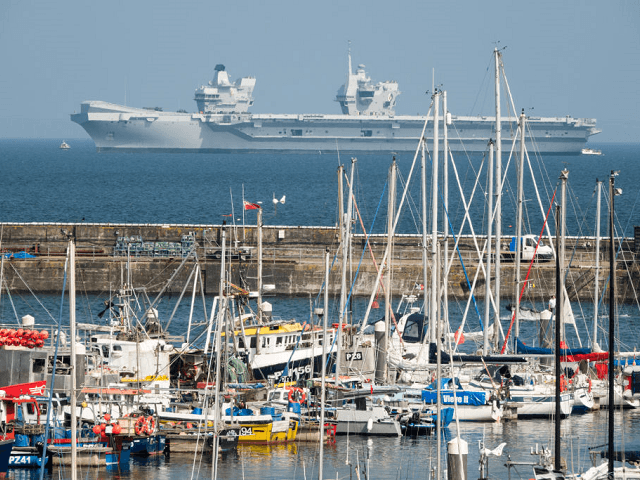 If the new funding is not brought forward, the British armed forces would continue to face significant cuts which have already seen large numbers of warships withdrawn from service and the size of the regular army cut. Particularly prominent among the list of deficiencies within the report that should be fixed with funding was the inability of the United Kingdom to protect the new Queen-Elizabeth class carriers (pictured, above) when they come into service, a gap in the quality of anti-submarine warfare — traditionally a world-beating strong point for the Royal Navy — and the “militarily illiterate” decommissioning of naval amphibious assault ships. Other areas included the offensive abilities of surface warships, “serious deficiencies in the quantities of armour, armoured vehicles and artillery” in the British Army, and the fact Britain “has no substantial missile defence capability”. The paper comes shortly after revelations in the British press that the UK government was coming under increasing pressure from the Trump administration to pay more towards the costs of the NATO alliance — a key issue for President Donald J. Trump during the election campaign in 2016, and beyond.